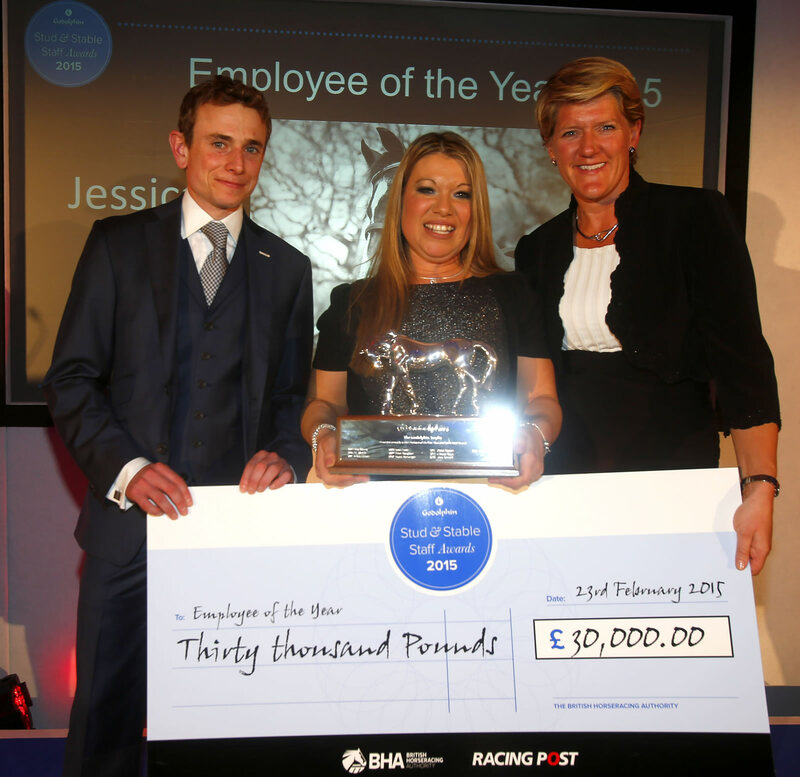 Manager, Jessica Fortt, from a Small National Hunt Stud crowned employee of the year at Godolphin Stud and Stable Staff Awards 2015. Following a gala evening ceremony celebrating the achievements of stud and stable staff from across the country at the Godolphin Stud and Stable Staff Awards, Jessica Fortt, Stud Manager for Dunraven Stud, has been named as Employee of the Year 2015. Jessica was awarded with the perpetual Godolphin Trophy by presenter Clare Balding and special guest presenter and three-time Champion Flat Jockey Ryan Moore at an event hosted by the British Horseracing Authority (BHA), and partnered by the Racing Post. She was also presented with a cheque for the total of a staggering £40,000, of which £20,000 will be shared amongst the staff at the Dunraven Stud in Wales. Jessica started her career at the Racing School and joined Dunraven Stud 16 years ago, after a bad facial injury ruined a promising apprentice career. She originally helped train pointers before moving on to the breeding operation at Dunraven Stud. Dunraven is a small National Stud based near Bridgend, standing two stallions, Dr Massini and Vinnie Roe. Jessica carries out all aspects of the work on the stud, including the office administration, stallion handling, foaling throughout the season, breaking in, updating owners and even sends videos to owners of their new foals. Her dedication, hard-work and passion typifies what the racing industry should be proud of in stud and stable staff. The Awards ceremony took place at the Jumeirah Carlton Tower Hotel in London’s Knightsbridge in front of a specially invited audience from across the racing industry to celebrate the vital role of stud and stable staff in the sport. All 16 finalists, including the winner of the Administration Staff Award, were praised by the judges for their talent, outstanding commitment and contribution to the racing industry. The winners were decided at a formal judging day held in the morning before the ceremony at the BHA’s London office, where the finalists were interviewed by members of the judging panel.